Hey guys,I know this isn't a fish report,but figured it would be seen more here. For those of you that knew Paul,he had a massive heart attack Thursday and passed on Saturday.He was my good friend and an even better fisherman. I have a handful of pictures of him,but are looking for more for his memorial. So I ask of you,if anybody fished with him and have some pictures could you post them up? So sorry for your loss as well as all that loved him. Prayers for all. Oh man so sorry to hear this !!! I may have a few pictures from years back if i can find any.. He was a really nice gentleman and although prefers to fish alone is always one to help and give advise and share a laugh. One of the few good old school Malibu guys.. He was hard of hearing which gave the wrong impression of him at times but wonderful man. Really sad to hear of this. Paul was a real good person and fisherman. I would wind up fishing on the water with him a lot on Saturdays. When I started going on Sundays I did not see him on the water as much. He always shared a tip or at least what he was fishing for. He was one of the guys like me who just got on the water and was happy to be there. RIP. Years ago I posted a thread with questions about launches and he private messaged me and gave me a bunch of useful info that I actually used. I really appreciated what he did and it shows how good of a person he was. While I didnt know him sorry to hear of this. Rest in peace. I had the same expierence. He also put in a lot of time. Solo fished from SD to SF sleeping in his truck. He was the real deal. I am in shock. Sorry to hear this terrible news. I met Paul many years ago doing PFA’s. (kayaksportfishing.com & Spikes). I got to fish and paddle with him a few times. Strong paddler and a helluva fisherman. Paul was a solid guy who I respected. Shared intel. Paul was a permanent fixture at Leo and County Line, always with a smile and story to share. I once did a gentleman's launch and he was just landing with a huge WSB. He gladly told me how and where, but the fish gods only favored Paul that day. It was a fun time whenever we fished with him. man that so sad to hear.. I only met him a few times long ago and he was the nicest guy willing to help with his fishing knowledge.. RIP. So sorry to hear prayers to you and his family such a loss. Very sad news, god speed to a better place. I remember running into Rad from time to time, way back when. Back then, he fished with a gentleman who called himself "Bing". By around 2010, I didn't see Bing anymore, just Rad solo. I haven't seen Rad lately, probably fishing different days I suppose. He was a very friendly guy, I will miss his company on the water. I forgot I had a pic of him up at deadman's just below naples reef, goleta. I think this was the early 2000's. I ran into him in some weird, off the beaten track places. Always with a smile, he was a really nice guy that will be sorely missed. Last edited by monkeyfishturds; 01-03-2019 at 12:58 PM. Remembering Paul and what he loved to fish for. I saw Rad launching at Will Rogers most of the times I ran into him. While I would fish Sunset (Blvd) Point, he would paddle to Santa Monica artificial reef close by. 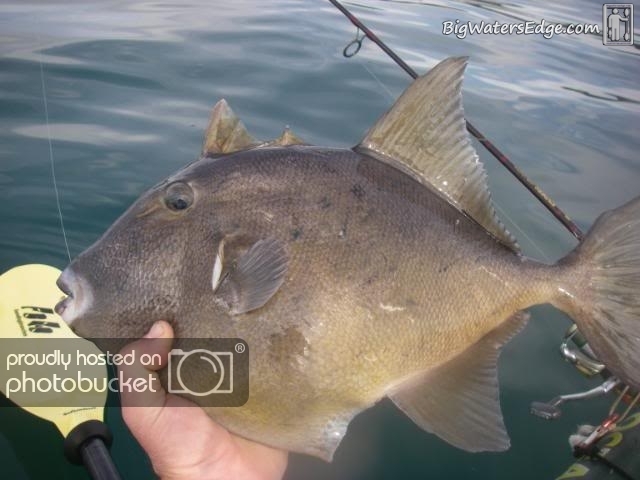 He would target a fairly rare fish for these waters, the trigger fish. I remember him posting this pic on kayaksportfishing.com site some years ago. Though i found this on bloodydecks where he re-posted it. It's hard to believe I won't be seeing him anymore. God speed Rad.